Often, the majority of adults, especially women, do not think about frail bones until they become older. According to the U.S. Department of Health and Human Services Office on Women’s Health, millions of women already have, or are at risk of developing, osteoporosis, a disease of the bones where a break or fracture can easily occur. 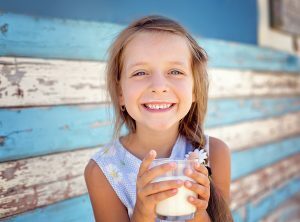 Unfortunately, most kids and women do not get the recommended daily allowance of calcium in their diet. However, no matter how old you are, it’s never too late to start building stronger bones. 1. Get enough calcium each day. Pregnant or nursing women need the same amount of calcium as other women of the same age. *The calcium amounts of these foods are taken from the United States Department of Agriculture Dietary Guidelines for Americans. Be sure to check the food labels for more information. 2. Get enough vitamin D each day to help your body absorb calcium from the food you eat. Vitamin D is produced in your skin when it is exposed to sunlight, or you can also get vitamin D by consuming certain foods, such as milk, or by taking vitamin pills. 3. Eat a healthy diet. Other nutrients (like vitamin K, vitamin C, magnesium and zinc, as well as protein) help build strong bones, too. Include foods like lean meat, fish, green leafy vegetables and oranges. 4. Get moving. Activity has been shown to slow bone loss and improve muscle strength. 5. Don’t smoke. Smoking increases your chances of getting osteoporosis. 6. Drink alcohol moderately (or not at all). Alcohol can make it harder for your body to use the calcium you take in. 7. Make your home safe to reduce your chances of falling. Use a rubber bath mat in the shower or tub. Keep your floors free from clutter. Remove throw rugs that may cause you to trip. Make sure you have grab bars in the bath or shower. 9. Talk with your physician about the risks and benefits of medicines for bone loss.